The temperature lately has been extremely chilly! Chris and I are constantly wearing our sweaters and jackets inside the house with the heater on. Yep, it’s that cold! Some nights, the temperature even dropped below freezing. We lost a few of our hibiscus plants because of it (I think! We don’t exactly have green thumbs). I’m hoping our citrus trees will survive through the winter. And speaking of winter, I made this soup to comfort our bellies. It’s easy, healthy, light but hearty at the same time. We paired it with grilled cheese, it was so satisfying. One of many things I love about winter —being able to eat a big bowl of soup to warm-up the tummy and feel totally content afterwards. You know what I mean. Have a great week! In a large Dutch oven over medium high heat add olive oil and ground turkey. Crumble and brown meat. Season with allspice, ground coriander, smoked paprika, salt and pepper. Add bay leaf, chopped onions, garlic and carrots. Cook vegetables for 2-3 minutes until they soften. Then add diced tomatoes, tomato sauce, turkey broth and cabbage. Cover and raise the heat to high. Let the pot come to a bubble. Then reduce to low and simmer for 30-40 minutes or until cabbage is cooked. Discard bay leaf and check for seasoning. Ladle soup into a bowl, add a scoop of white rice on top, and garnish with chopped parsley and dill. Looks so comforting, perfect for a snowy day like today. xoxo, Angie. What a delicious looking soup! And wonderful photos! Mmm – I just love cabbage in soup (I think it comes from a year I spent in Eastern Europe after college) – there’s something so caramelized and delicious that happens to cabbage when it’s cooked into soup. Love this recipe, Anne. so delicious and heartwarming! it’s getting cooler here (as far as it’s possible for an island on the equator) and somehow my mind is tricking me into craving soup! Mmmm…I love cabbage and need to work it in soup. Thanks for the inspiration, Anne! I love that you used turkey broth. I made use of our turkey leftovers for the first time after Thanksgiving this year and realized how great it is! Made a soup with turkey broth (too lazy to make my own stock from the carcass) and it was so good – plus, we had a few bites with rice and it was so good. Everything you already know, clearly. We have a snow day here today and I want this soup!! Stay warm. I have my booties and scarf on in the house right with ‘ya! Love cabbage in the soup. This is the kind of recipe I need to prepare more often, so nutritious and complete! This looks good for the soul. I need a bowl of this to warm me up! Soup is definitely one of the best things about winter! I could use a bowl on this snowy day today! Soup is my favorite in cold weather – this looks like a big bowl of comfort! It has been cold here, Anne! I’m in SF with a frozen face and hands on my way to school and had to stop at Sbux to warm up. I need a bowl of this soup — it looks so warm, inviting, and delicious! I love the sound of this hearty soup with grilled cheese! 😀 I’m in Canada at the moment where it is freezing and I’d love this for lunch! Such a comforting and warming treat! Perfect for the season. The pictures are amazing, so is the recipe. Beautiful combination of spices and textures! It’s a gross snowy/slushy day out here in NY. I was just thinking how much I want to make soup and grilled cheese for dinner tonight. We are totally on the same wavelength! Looks like such a warming, hearty bowl of delicious! It is snowing outside not to mention cold. Have cabbage in the fridge so will be making cabbage soup. I can’t wait until I get my dutch oven and I can finally make all these hearty soups. So yummY! I absolutely love cabbage! Definitely going to have to try this soup. Have a great week Anne! This soup would warm me up right down to my toes! Great recipe. It’s officially soup weather here in the Midwest too! What a beautiful bowl of soup, I can just imagine the aroma. Bundle up and stay warm this week! We finally got some relief from the warm weather today since the temps are down in the 50’s. 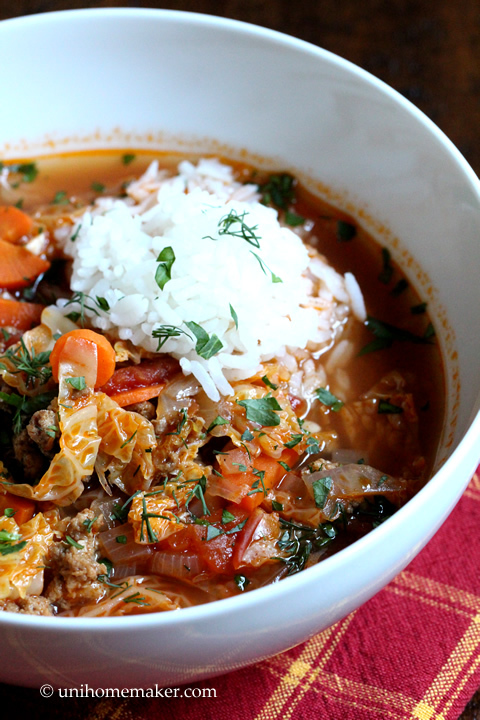 I’ve had the biggest craving for soup all day today and this hearty turkey cabbage soup would definitely satisfy that craving. Thanks for sharing! It’s been so cold here too! Whenever I sit at the computer I have a huge blanket wrapped around me and my fingers are still cold! And yes to this soup – it sounds and looks wonderful. I totally agree – soup is so satisfying this time of the year! A wonderful soup you have here! So nicely spiced and I would love the savoy cabbage! I wish I could have this right now. Perfect evening here for a nice hearty soup as this. Gorgeous photographs too! As a kid, I hated cabbage. I didn’t like the smell of some of the boiled cabbage dishes, even if everything else tasted great that smell just turned me off. This post could not come at a better time, the cold is so pervasive here that it’s hard to think of anything other than this cold weather! This soup is the perfect antidote. Thanks for sharing!! This soup makes so much sense Anne. I can’t believe I have never thought to combine these flavors. GREAT idea and as you say, perfect for this cold weather. (I was calling it chilly but it has passed that by a mile:) I do hope your citrus tress make it. Did you cover them? You can try wrapping them in burlap or an old blanket. Good Luck! I need cabbage soup in my life asap! My mother used to make a soup like this based on her own mother’s recipe, but never with turkey. I love turkey, so I can’t wait to try this! We are having a bit of a heat wave here (crazy, right??) but this still looks so tempting! You have such a gift for making everyday dishes look and sound special, love the photos! This sounds super delicious! I feel like I live in the frozen northland sometimes, so I’m always on the hunt for a new, tasty soup recipe. Thanks for posting! Oh, so comforting and soothing… looks perfect for our cold winter Anne! This soup looks delicious!! So warm and comforting. I just love soup!! It looks so inviting. And I must say I love the presentation. We are dipping down to 1º tonight so hot comfort food is in demand! 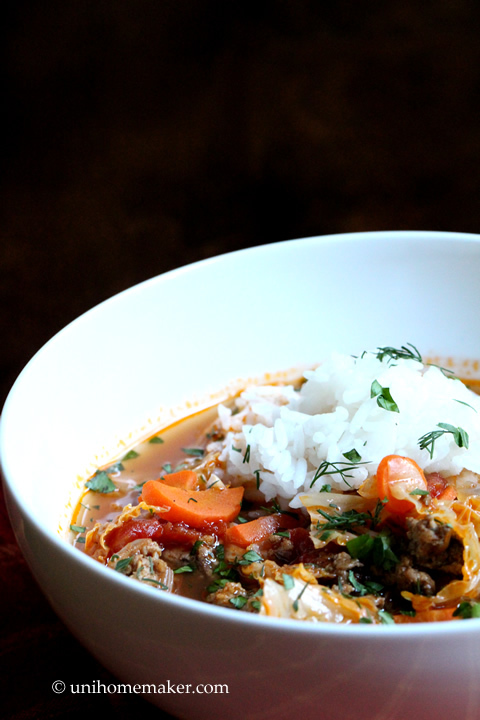 Your soup looks amazing…I always love the addition of cabbage, so I know this is a winner. Thanks, Anne!! You are too funny, Anne! I don’t even have much of a green thumb. 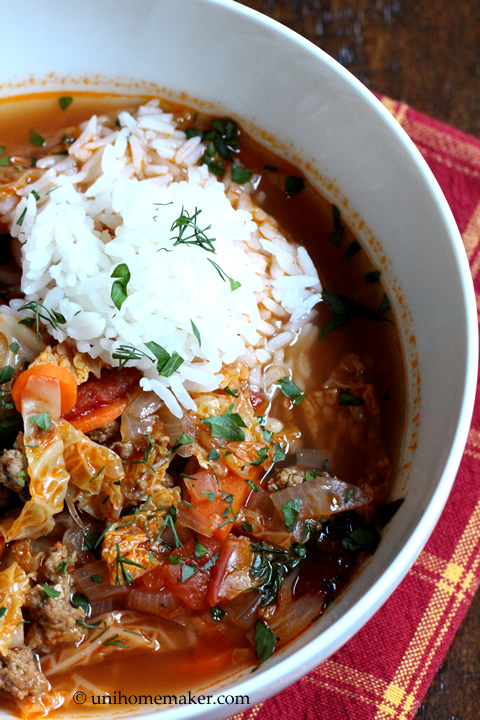 LOVE cabbage…and the way you have it in this soup looks beyond delish. Stay warm! Heck, lately we’ve been delighted when we see temperatures above freezing! Gonna be 6 degrees F tonight. Anyway, super soup – this looks so terrific. Love this – thanks. Mmmm.. that looks SO good Anne. Even if it is ridiculously hot here (*sorry! *) I could still demolish a bowl of this. It is definitely soup weather here with the high today only going to reach 19. 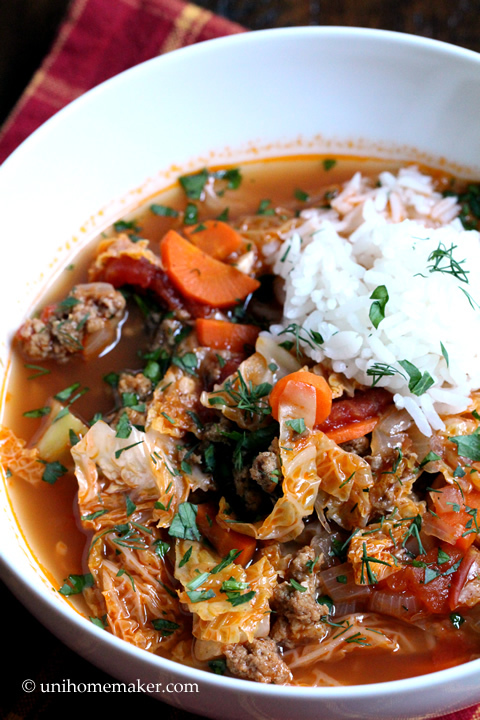 Your soup sounds delicious…I love cabbage rolls so I know I will love this soup. Great looking soup! Love that visible rice in the photo! This is the kind of soup that just warms you from the inside out! It looks absolutely delicious Anne and perfect paired with a grilled cheese! One of my favorite meals this time of year. Soup and grilled cheese really is the perfect combo 🙂 This looks yummy! I love stuffed cabbage.